Joint with Silke Horn I initiated the polymake database as an extension to polymake. Currently, it contains data about lattice polytopes and tropical oriented matroids. It can be accessed via polymake or here. 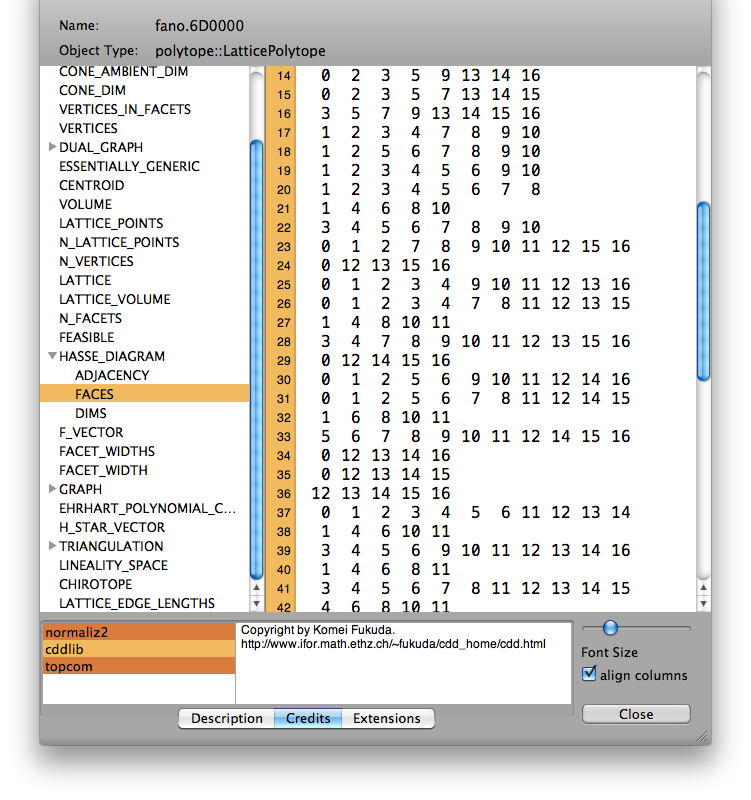 PolyViewer is a Viewer for Mac OS for files created by polymake. It can also be used to view the properties currently defined for an object from inside the polymake shell. The sources are at github. You have to install polymake to use these extensions. Installation instructions for extensions to polymake are here. More information on polymake is here. Contact me if you have problems or questions. via an interface to ntl. In version 0.6 I changed the definition of integer_kernel: Now applies to the transpose of the matrix, to conform with the standard function null_space. The extension requires the lll-extension from above. The methods and properties of this extension have been integrated into the polymake toric project. You can download the extension from github, which many more properties than in the extension provided below. The latest version of this extension can be found at github. This extension provides methods to do push-forward projections of polytopes. An application of this is described in my paper with Christian Haase On Fanos and Chimneys, where we construct regular unimodular triangulations for smooth reflexive polytopes. A more detailed paper will appear soon. This extension is maintained on at github and provides an still experimental and limited extension that provides a new application bimatrix_games to polymake. It can compute Nash equilibria of bimatrix games. The only new data type is BimatrixGame that can take a pair of matrices of equal dimensions as input in PAYOFF_MATRICES. It can compute the set of extrem Nash equilibria, their payoffs, and the connected components of the extreme equilibria for a degenerate game. Further, it defines the associated polyhedra for the game. The employed algorithm is only mildly efficient, and it only works for polyhedra that have positive payoff (see comments in extension for more details). In all other cases the extension uses support enumeration. You might need to restart polymake after you imported the extension. Note that you have to install barvinok to use the extension.